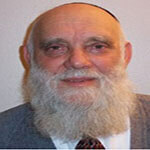 Rabbi Glazerson was born and educated in Israel. He studied at Medrashiat Noam in Pardes Chana and at various Yeshivot, including Kfar Chassidim, Ponievez, and Chevron. In 1964, after just being married, he went to Johannesburg, South Africa, where established the Yeshivah Torat Emet and became its head until he returned to Israel in 1980. Rabbi Glazerson has been involved in bringing many Jewish youngsters back to their Jewish roots. He has authored more than 30 books in Hebrew, most of which have been translated into Russian, French, Spanish,and English. For fifteen years, Rabbi Glazerson wrote a weekly column for Yom HaShishi in which he related words associated with current events to other Hebrew words having the same gematria. It is by way of the Hebrew letters and gematria that Rabbi Glazerson teaches Torah, instilling and inspiring Jewish values in those who read his books.